The peaceful atmosphere on the Korean Peninsula, which started in Pyeongchang, is spreading throughout the world. The upcoming inter-Korean summit, which will be held between President Moon Jae-in and leader Kim Jong-un at the Peace House inside truce village of Panmunjom on Friday, is expected to be a starting point for the establishment of a peace regime on the Korean Peninsula and denuclearization of North Korea. The inter-Korean summit is particularly significant as it will serve as a guide for the North Korea-United States summit to be held a month later. There are many optimistic prospects as the summit has been confirmed with North Korea's active willingness to talk. However, experts point out that there is a lot of things to get through in order to achieve fruitful outcomes. Experts say that the "direction" of denuclearization and establishment of a peace regime on the Korean Peninsula should be shaped first in order for the inter-Korean summit to be successful. They say it must be on the right track for the success of the North Korea-U.S. summit. 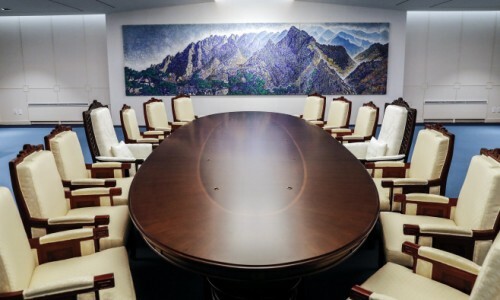 "Clinging to creating moods or making any declarations could rather bring various negative consequences and make the situation difficult," said Jeong Young-tae, head of the Institute of North Korean Studies, in a phone interview with Asia Today on Wednesday. "The issue of peace settlement cannot be solved in a short time," Jeong said. "It can be achieved by keep setting a certain direction and make efforts," he added. "It is good to say that the inter-Korean summit is a guide to the North-U.S. summit, but it is not desirable if we merely serve as a mediator," said Kim Joon-hyung, a professor at Handong University. "We need to play the role of shaping the direction and making a fence." Cho Bong-hyun, an analyst at the IBK Economic Research Institute, said, "At the beginning, it is important to shape the direction for the follow-up summit to take place. Even if consensus is reached between the two leaders, the nuclear issue should be discussed with each other. Therefore, follow-up discussions should be made through high-level talks." Experts suggest that the leaders of two Koreas should reach a consensus to develop a concrete plan for denuclearization while shaping the direction so that it can be completed in the North-U.S. summit. "The inter-Korean summit will serve as a guide to achieving good results in the North-U.S. summit," Cho said. "The leaders should reach a consensus focused on various issues for the Korean Peninsula's denuclearization, the establishment of a peace regime and the sustainable development of inter-Korean relations within a large frame, so the United States and North Korea can finalize them." Nam Sung-wook, professor of North Korean Studies at Korea University, said, "The term denuclearization should be included in the summit so it can serve as a starting point of the denuclearization and move onto a productive stage." Shin Beom-chul, a senior fellow at the Asan Institute for Policy Studies, said, "Although the summit is aimed at building trust, we need to make progress in the denuclearization." "The concrete contents of the denuclearization is in charge of the U.S., and North Korea won't talk about it with us. But it is important for us to draw more concrete and proactive measures on denuclearization compared to the past," Shin said.